• Cellophane wrapper lately crushed in a monster’s fingers uncrimps on the counter as Anton Chigurh (Javier Bardem) teaches a gas station owner (Gene Jones) to appreciate what a remarkable quarter has entered his life: No Country fir Old Men…. • In The Diving Bell and the Butterfly, aged Max von Sydow gazes into a mirror, flanked by a photograph of his screen son Mathieu Almaric … the startling resemblance between these cinematic kin…. • In a dim room crowded with frozen figures, the kid in Cashback who can stop time glimpses a hooded silhouette in motion…. • Starting Out in the Evening: Confronted by a redheaded beauty (Lauren Ambrose), the elderly gentleman (Frank Langella) involuntarily covers his face with his hand—to hide his age or to shield his eyes from her bright heat…. 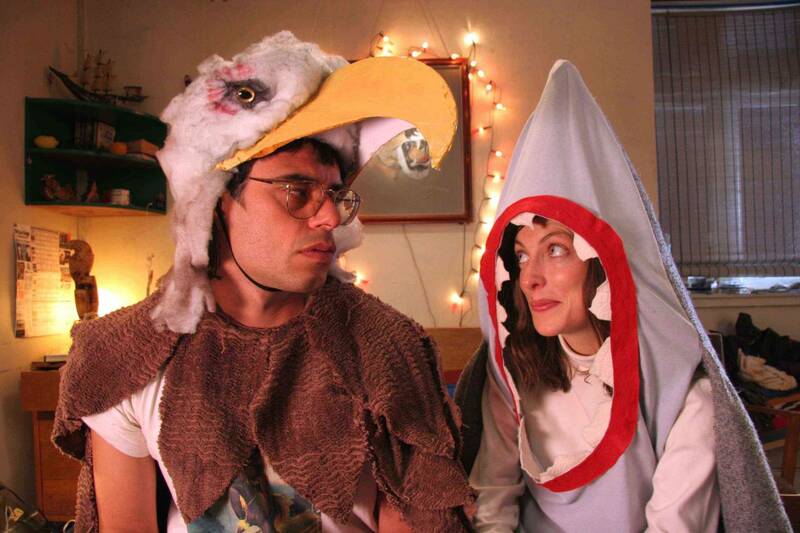 • Eagle vs. Shark: she’s the shark, he’s the eagle at the costume party, where it takes a video-game duel to tilt this geeky pair into love…. • Playing her piano by an open window in Once, a sweet-faced girl (Marketa Irglova) gazes out, perhaps recalling a long-gone friend. The camera recedes, turns and leaves her and the movie behind…. • In Disturbia, the boy (Shia LeBoeuf) under house arrest desperately searches for clues in a cellphone video of his nextdoor neighbor’s living room, when something—an eye?—comes into focus behind the grill of a heating vent…. • In Gypsy Caravan, a Greek diva, her face obscured by a black veil, stands stock still, only her magnificent voice and expressive hands telling the story of kin murdered in Kosovo…. • Paprika’s Fellini-esque parade of all the stuff that’s piled up in our unconscious: machines, gods, toys, emperors, animals, robots, etc … and the swarms of blue butterflies that signal imagination gone wild…. “We don’t give out that information”… No Country for Old Men’s Chigurh meets his match in a tough old trailer park broad…. • In Savages, dad turns off his hearing aid, to stare out the car window at a cemetery, while his children wrangle, a universe away…. • The Savages: You can almost see Wendy willing herself not to look under the sheet and see whether, as the best reports have it, her dad’s toes have curled over in death….